See below for special Galapagos cruise discounts! Galapagos Specials are listed below under Cruise Rates. We consistently offer more specials and discounts for Galapagos than any other company. All of our Galapagos cruises and tours depart on a weekly basis throughout the year. The breathtaking Galapagos Islands are closer than you have ever imaged with Inti Travel. If you are looking for Galapagos cruises or any other type of Galapagos trip, you will find the best possible packages right here! Now, you can finally make your Galapagos dream a reality at prices that are within your budget. Explore the stunning shorelines on Galapagos boats or as a part of the Galapagos cruises that we offer. If you have ever been interested in seeing the unbelievable waters that surround the legendary islands of the Galapagos and view the amazing wildlife on visits ashore, now is your chance to take advantage of the Galapagos trip packages that are currently being offered as a part of our wide Galapagos tours selection. Hop aboard our Galapagos ships and witness the unforgettable! Create memories that will last a lifetime as a part of one of our world renowned Galapagos tours. Join us for a journey you will never forget! See below to view our reasonable rates on a Galapagos trip of a lifetime! Inti Travel and Tours and our Ecuadorian associates invite you to join us on your journey of a lifetime to Discover Galapagos. We offer a variety of Galapagos cruises and tours on quality ships and yachts and/or Galapagos hotel accommodation with day cruises and tours. We provide comfortable accommodation, excellent meals, friendly crew and a professional naturalist guide. We have worked directly with the owners of the Galapagos ships and yachts since 1979 and offer you the best rates possible. Our price range will accommodate a wide range of budgets. Add one of our travel packages to your Galapagos cruise! Due to Government measures in Ecuador, many of the ships and yachts operating in the Galapagos Islands were subject to a fuel tax as of June 1, 2008. The amount of the fuel tax varies depending on the fuel consumption for each vessel (not all yachts are taxed) and is identified under rates on the web page for each ship or yacht to which the fuel tax applies - just follow the links below. Sea surface temperature is about the same as the average minimum. and then click in the opposite temperature block for the conversion. Hiking, Swimming, Snorkelling, Wildlife Viewing & Photography. Snorkelling gear and wetsuits included. Hiking, Swimming, Snorkelling, Wildlife Viewing & Photography. Snorkelling gear included. Wetsuits available for rent. of Santa Cruz. Rate is for room only. Hiking, Swimming, Snorkelling, Wildlife Viewing & Photography. Snorkelling gear and wetsuits available for rent. Hiking, Swimming, Snorkelling, Kayaking, Wildlife Viewing & Photography. Snorkelling gear and wetsuits included. Hiking, Swimming, Snorkelling, Wildlife Viewing & Photography. Snorkeling gear included. Wetsuits available for rent. iking, Swimming, Snorkelling, Kayaking, Wildlife Viewing & Photography. Snorkelling gear and wetsuits included. Hiking, Swimming, Snorkelling, Wildlife Viewing & Photography. Snorkelling gear included. Wetsuits for rent. Hiking, Swimming, Snorkelling, Kayaking, Wildlife Viewing & Photography. Snorkelling gear included. Wetsuits for rent. Hiking, Swimming, Snorkelling, Kayaking, Wildlife Viewing & Photography. Snorkelling gear included. Hiking, Swimming, Snorkelling, Kayaking, Wildlife Viewing & Photography. Snorkelling gear. Wetsuits for rent. Hiking, Swimming, Snorkelling, Wildlife Viewing & Photography. Snorkelling gear included. The rates for the ship or yacht includes accommodation aboard the ship or yacht, all meals, island sightseeing, all guide and lecture services, transfers in the islands and between the airport and yacht in Galapagos. Itineraries are subject to change without notice (for safety, environmental or any other reasons). Galapagos flights, Galapagos Entrance Fee (includes the municipal tax, currently $100 US per person payable in cash to the national park authorities in Galapagos), Galapagos fuel tax, tourist transit card ($10 US), tips (it is customary to tip the guide, chef and crew) soft drinks, alcoholic beverages, and any other extras not specifically mentioned. All prices are subject to change without notice. Due to Government measures in Ecuador, many of the ships and yachts operating in the Galapagos Islands implemented a fuel tax as of June 1, 2008. The amount of the fuel tax varies depending on the fuel consumption for each vessel and is identified under rates on the web page for each ship or yacht. When we reconfirm your reservation for the yacht, ship or hotel we will make the reservation for the Quito-Galapagos-Quito (or Guayaquil) flight so you are ensured space on the plane to meet our boat. Galapagos tickets and boarding passes are issued at the airport on the morning of the flight. The Quito-Galapagos flight schedules vary depending on your ship or yacht. 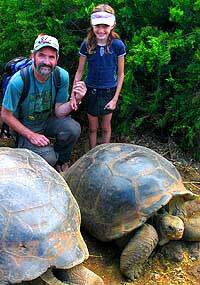 Please be advised that there is a limit of 20 kilos (40 lbs) of checked luggage (per person) on the flight to Galapagos. The rates for the Galapagos flight vary depending on which airline the ship, yacht or hotel uses. As an example, the Quito-Galapagos-Quito flight varies from $450 US to $550 US per person. We accept Visa, Mastercard and American Express. Otherwise, payments must be made in U.S. dollars through bank wire unless otherwise specified. We do not accept personal or company checks. At time of booking a 20% deposit is required (may vary depending on travel dates). Balance required 60 days prior to departure. - For reservations including dates between Dec 17-Jan 1 AND for cruises aboard the Celebrity Xpedition, Galapagos Legend, Coral I, Coral II, Eric, Letty & Flamingo and Aqua and Arias the balance is required 90 days prior to departure. - The owners of the Galapagos Legend, Coral I and Coral II reserve the right to demand a full non-refundable payment at any time. If you are considering booking one of these yachts, please ask for the full Terms and Conditions issued by the owner of these yachts so you are fully aware of their specific policies. - We require a 20% non-refundable deposit for the Santa Cruz, La Pinta, Isabela II and Finch Bay Hotel Resort. Failure to provide payments by deadlines indicated in invoices may result in cancellation of the cruise or tour and forfeiture of deposits. We provide receipts immediately after a deposit, and a Travel Voucher & Receipt after your final payment. Our Travel Voucher and Receipt is recognized by all of our associates and is all that you will need for your trip. The payment schedule for groups and charters may vary (please ask). We must receive notification of cancellation in writing. More than 120 days prior to the departure date the initial deposit is refundable although we may retain an administrative fee of up to $300 US per person. 120 - 61 days prior to departure the initial deposit is forfeited. Less than 61 days prior to departure the full price is charged as a cancellation fee. No refunds are available for unused portions of any tour, package or cruise. Cancellation policy for groups (6 or more people) and charters may vary depending on the cruise or tour (please ask). For the Celebrity Xpedition, Santa Cruz, La Pinta, Isabella II, Finch Bay Hotel Resort, Galapagos Legend, Coral I, Coral II, Sky Dancer, Eric, Letty and Flamingo and Aqua, AND any reservations including dates between Dec 17-Jan 1, all payments made are forfeited upon cancellation.